They are the best judges of your barn and your care. The trick is to pick up this information by reading their body language. We have noted that even experienced persons miss much information when observing cows. Our reaction was to develop training to improve basic cow knowledge and the quality of cow observations. We based the concept on the systems’ theory . . . a scientific theory to manage complex systems, such as dairy barns. Using this approach, we focus on the characteristics and the needs of the cow centrally. Dairy farming is about cows. Part of the problem is caused by the fact that the information farmers are getting usually is disciplinary . . . nutrition, housing, economics, climate, and so forth. They, as well as many of their advisors, struggle to combine all these aspects into a manageable system with the best possible welfare, health, and milk production. Solving the wrong problems . . .
Perhaps you can envision the case of someone changing their ration over and over until they realize that the nutritional problem basically comes from poor access to the feed due to too small alleys, aggravated by massive hierarchical stress due to limited availability of feed. Another example could be dry cow care. Scientists and consultants went into deep detail about the nutritional formulation of dry cow rations and painfully overlooked cow factors as stress, micro-climate, water intake, physical exercise, and comfort. Luckily, this has changed. Does it make sense to advise on the amount of water supply in inches drinking space per cow? It does not when you do not take the positioning of the water troughs into account, plus the access ways to them. How much trouble does any cow have to go through to get to ample, clean water? cows plus the percentage of damaged knees and hocks gives you a good impression. between looking and seeing. The reward consists of insight and knowing that everything is going as wanted or that you need to take action. Looking objectively starts with asking questions. The first one is “what do I see?” By challenging yourself to objectively describe what you observe, you learn to distinguish and to make judgment. Let’s try this. Describe the difference between an arched back due to abdominal pain and an arched back due to two sore hind legs. The second question is “how does this come about?” Did the cow drop in body condition score from 4 to 3, or did she stay 3 during the whole start of lactation? Are the tails dirty because of endometritis or vaginitis? Is the heifer still standing in the stall due to stress or just because she has never met with a stall in her life before? (improvements, actions) possible. You have to find the most important area of intervention and the best intervention. 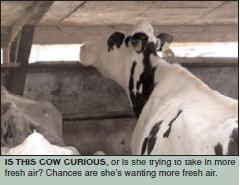 Here’s an example: Weak cows will lie down less than healthy cows in poorly designed stalls. You observe signs of ruminal acidosis and laminitis, cows with low body condition score, and too many cows standing in stalls. Where do you put your first intervention ... in the ration or in the stalls? Both likely will improve the situation. We often say “look-think-act.” But essentially this is wrong. The concept is “see-understand-act.” The goal is to see your barn as if you are in some stranger’s barn. You need to pick up as much information as you can during check rounds and while doing the work. First thing is to observe from the big picture down to the smallest detail and back. For example, study the herd, then groups of cows, then individual cows, then parts and details of the cows, and then back to the big picture. Your reference points should be: Are we meeting the basic needs of the cows . . . feed, water, light, air, rest, space, and good health. Plus, are all risks well managed and not causing stress? We categorize risks as risk areas, risk periods, and risk animals. In our training, we use checklists that start with herd observations and general impressions. Two terms are very helpful when observing cows. The first is the intention of movement. This also is called waiting cows or hesitating cows or an I-want-to movement or an I-don’t-want-to movement. An intention of movement is what you see when a cow intends to do something, starts moving, and then stops. Something is making the cow not do what she wants whether it is eating, drinking, walking around, or lying down. What is causing this disturbance? To stimulate people to always be curious and looking for the unexpected, we have identified the “uno.” When you clearly see something that you do not understand, you have found an uno . . . an unclarified notable observation. Identifying unos and trying to understand them stimulates learning and personal development. The term uno is supposed to make people smile. But acknowledging the fact that, for every person there are things they do not know or understand, makes it much easier — and more fun — to look for them and to discuss them. Too often we do not see the big picture, or we focus too much on details. Dairy farming is about cows, and 80 percent of the success in your barn comes from 20 percent of your efforts. This 20 percent consists of meeting the basic needs of your cows . . . feed, water, light, air, rest, space, and absence of infections. It does not necessarily include details such as feeding yeasts or protected amino acids, or using the latest genetics. Those details take your success percentage from 80 on up. Our concept is explained in a book called Cow Signals. People in Holland believe that the concept has really put the cow in focus and, thus, clearly improved quality of management and housing. Research in Germany showed that 60 percent of the farmers who were at a presentations or workshop actually improved something afterwards. The cow signals training also improved job satisfaction and appreciation of dairy farming by the community. In Europe, society actively rejects it when farmers do not see their animals as animals and treat them with respect. The general public recognizes quality when they see it. And when they see professionality and respect for cows, they will respect dairy farmers. The author thanks Dirk Zaaijer, Nico Vreeburg, Joost de Veer, and Joep Driessen for their contributions. And Jack Rodenburg of the Ontario Ministry of Agriculture and Food for his help. Jan Hulsen is a veterinarian in the Netherlands. I need to know cows will tel what they need??? Your comments reminded me with myself when I was doing my technical visits to the dairy farms as a marketing manager. This is so great sentence .. (( We often say “look-think-act.” But essentially this is wrong. The concept is “see-understand-act.”)). and by the way I liked your term (UNO). You are right. Bur it starts with looking!